There have been many struggles along the way, but at least I can say that at this point there a handful of lessons that I've learned…and at this point home life feels much more under control than it did during those first couple years. Although everyone has their own experiences, successes and failures, I've always loved learning about what people have done to make their own home life a bit more calm, happy and organized. 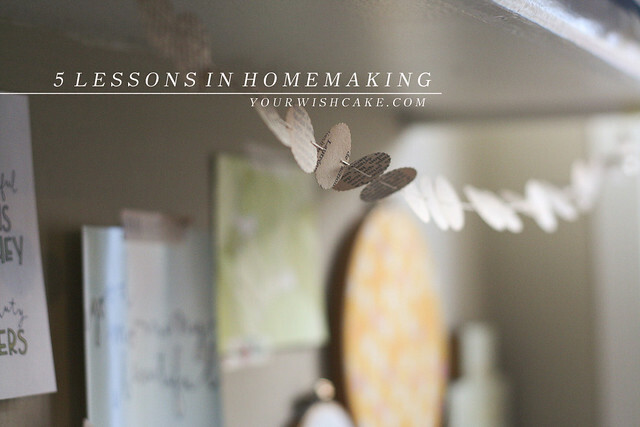 I thought I'd share a few of my own lessons in homemaking and hopefully encourage those of you who are still (like me!) very much in the trenches of their own journey. For some reason, it took me a while to find a groove when it came to cleaning—mostly because when both my husband and I were working full time, I had to fit in cleaning here and there throughout the week and never had a real schedule. A couple years ago, I finally started consistently starting every Monday with a fairly thorough cleaning (dusting, vacuuming, sweeping/cleaning kitchen floor and stove, cleaning the bathroom, etc.). Because our place is by no means large (we live in a 1-bedroom duplex, around 900 square feet) I'm able to do this cleaning in a couple hours, which is one perk of living in a small space! I love starting the week with a clean home, and last year started doing another quick cleaning (dusting, vacuuming, sweeping, cleaning bathroom sink/toilet) every Friday morning—to start the weekend off right, too. The fact that it keeps me from being a tight ball of rage by Sunday afternoon while watching dust bunnies swirl around the coffee table makes it worth the extra effort. Living in a small duplex means that I am always battling clutter and messes of some sort. Because my daughter doesn't have her own room, most of her toys, books and other playthings tend to end up in the living room—and I've definitely had to work on being that mom who doesn't freak out over every little mess. What has worked for me is to make the time to tidy up our main living space twice a day: every afternoon (before Eisley's nap or "rest" time) and every evening (before bedtime). I love having these two points during the day when I know my world will be in order and I can breathe easy. When I was a young girl, I used to wonder why my mom couldn't just leave the mess from dinner and come join the rest of us with a bowl of ice cream and an episode of Crocodile Hunter and just relax. She always wanted everything in its place and the counters wiped off before she sat down. Of course, I have completely become my mother in this way, and totally get her reasoning now. There is something about sitting down at night (and waking up in the morning!) knowing the sink is empty, the counters are clean, and the dishwasher is gently humming as it does most of the dirty work. One of my biggest dreams in life is to have my own in-home washer and dryer—for the first time in adulthood, that is. (Yes, I dream big.) But so often I hear of people who even have their own laundry rooms (I do not dare to dream that big) and claim laundry as their biggest hurdle in homemaking. I wonder if I would be the same way if I had the luxury of doing this chore at my own pace, in my own home. Instead, I have to pack my car with 7+ days worth of laundry once every week, head to our local laundromat, and fight the blasted change machine (which clearly has a thing against $1 bills). However, as much as I've dreaded this chore throughout the years, I realize that it's kind of awesome to get that much laundry done in less than 2 hours...including folding and putting away everything. There can be a bright side to these things, right? Right. When it comes down to it, I realize our home will never be the picture of perfection I sometimes so desperately want to reach. We will probably always have somewhat mismatched, hand-me-down and well-worn furniture. Our shower will never be perfectly scrubbed and our closets will never be beautifully organized. With a young daughter in our midst, our couches will probably always be covered with a light dusting of princess-dress glitter. But as time goes by I'm learning (ever so slowly) to relax and remember that homes are best lived in. And comfy and cozy and familiar to those who live there. I clean what I can clean, decorate with what I have, and organize when I get in one of my moods. But otherwise, I'm learning to pick my battles when it comes to my expectations of what our home should be. Although I recognize how far I've come in the past few years, there are still many aspects of homemaking and my own day-to-day that I feel I need to work on (and am actually eager and unafraid to tackle this year). Meal planning (more than my current lazy-lady version! ), creating a budget to guide our spending and saving (for the first time ever—I know), cooking and baking from scratch more consistently, finding a homeschooling plan to stick to, and finding ways to add income each month through this ol' blog. The Ultimate Homemaking Bundle will only be available from 8:00 a.m. EST on Monday, April 20 until 11:59 p.m. EST on Monday, April 27. I love that they also offer a 30-day 100% satisfaction guarantee, so if for any reason you are unhappy with your purchase, then you simply contact them and they'll give you a full refund. If you have any questions about this specific bundle, please let me know! To learn more about what is included, or to purchase your own, simply click here (or the fancy "buy now" button above) and you'll find everything you need. If you end up purchasing one yourself, let me know what you end up loving and if there are any specific books or courses I have to be sure not to miss (because I know there is so much to dive into within this bundle!). I'll be sure to check in next Monday (before the sale officially closes) to let you know any progress I have made in the past week—and to share details on the specific resources within this bundle that are my favorites so far. Affiliate links included in this post. When you purchase an Ultimate Homemaking Bundle through my links, I will receive a small commission at no extra cost to you. Thank you for your support! View my disclosure policy here.